This is one of the dishes most often cooked in Cuba for family meals or to share with friends. 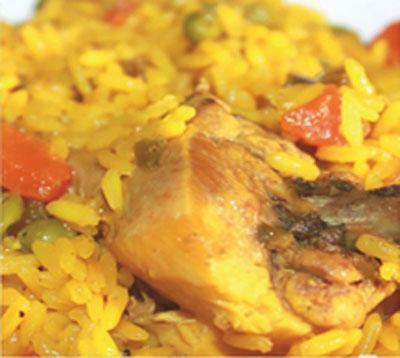 A colourful culinary treat, a good arroz con pollo incorporates the values and the beauty of our customs and traditions. Clean the chicken breasts and chop them into pieces. Wash the rice. Peel and slice the onion. Peel and slice the peppers. Wash and quarter the tomatoes. Peel and crush the garlic. Heat the oil in a large saucepan. Add the onion, peppers, garlic, cumin and salt. As they begin to fry, add the chicken. Add the rice and cook for a few minutes. Add 3 cups of water, the beer, tomato puree, bay leaf, rosemary and oregano. Season with salt and pepper and leave to cook until the rice fluffs up and is cooked through, adding more water if needs be. Add the petit pois and lime/lemon juice and stir. Add the sliced morron peppers, cover the saucepan and turn off the heat, leaving it to stand for a few minutes. If you are able to find a banana leaf, cut it down to size and lay it across the rice between the saucepan and the lid until you serve it. Traditionally an arroz con pollo is accompanied with fried green plantain tostones or fried ripe plantain and fresh salad.